What exactly do we mean by FULFILMENT? These are the things that FILL YOUR CUP. The factors that motivate you when you wake up each day… the things that make you feel accomplished at the end of each day. It is your why… your reasons for doing what you do… it is what your ideal Life+Work would allow you to feel … who it would allow you to be. No matter what your fulfilment factors are, what matters is that you can DEFINE it for yourself - otherwise you’ll never find the opportunities to make it happen OR you’ll spend your life chasing someone else’s dream (because often times when we’re unsure of what we really want, we’re misled to think we want what society or others want). Overall, how does your work make you FEEL? Do you feel energized or drained most of the time? Inspired or jaded? Why is the work you do important? Who benefits from your product/service? Does it feel meaningful/purposeful for you? Do you love what you’re working on and do you feel it is creating real value for you and in the world? How do you feel about the outcomes your job supports? How does your work enable you to be a better version of you / to enable others to do their work better / to make the world better? Do you believe in the positive good of what you’re doing, and that what you’re spending your precious time and energy on is really worth it (ie compromising more time for your family / other things)? When do you feel valued for your work and worth? What are your personal KPIs? How do you measure your success? How do you prefer to be recognised? Are you able to be yourself at work? Is the way you work honored and respected? Everyone wants and needs to feel + believe their work is important and valued. Money is an indicator of your performance (and the company’s) but it is not always a reflection of how meaningful and important the outcomes you’re working toward really are to you. There’s different ways to think about your work values. One way is to think about the factors that motivate + drive you to do good work. Another way to think about values is to consider the principles + beliefs or “truths” you live by like standards of behaviour or personal judgments about what matters most in your work-life. Some people prefer to separate their at-home and at-work values systems. Others prefer to live and work by the same values. There is no “one” way to think about your values. What’s important is that you know your values and what they mean to you. When you’re unsure about your values, it’s sometimes easier to think about what you don’t want - your “non-negotiables”. Fulfilment Factor #2 is about your work-life RELATIONSHIPS. How you experience relationships + interactions in the workplace has a direct impact on your sense of fulfilment. It’s not solely about your job function or tasks. We are social beings - we need connection, dialogue and positive interactions to feel engaged, supported and part of something greater than ourselves. A toxic work environment can eat away at you over time - though you may not even realise it - and hinder you from thriving. ASK YOURSELF: Do you feel you can communicate honestly/openly with them? Do you feel supported? Do you feel valued, respected, and empowered? Is there someone you can trust and speak openly with about your challenges / goals? ASK YOURSELF: What is the leadership style? Is there a healthy leadership dynamic? How are people treated - respected or belittled? How are mistakes dealt with? ASK YOURSELF: Is there a positive and collaborative spirit? Are people (including you) encouraged to voice their views/opinions? Are they heard? Is there transparency? If your workplace relationships aren’t contributing to your sense of happiness + wellbeing, or worse, creating a negative / toxic environment in your daily work-life, take initiative to change the situation in a constructive way. Fueling gossip and negativity in the workplace isn’t serving anyone. And it’s not professional. FIgure out who you can speak to at work or what initiatives you can take to improve things. Reflect on your own behaviour and how you can change your attitude, communication style, or lead by example instead of just complaining. Fulfilment Factor #3 is about your FUTURE. Your career is for life. That means, every job / professional experience you have should be furthering your personal/professional development; enabling your career growth; and carving your future trajectory. You may not be learning something new everyday, but you should be improving on your core skills and building new ones. Do you feel that your strengths and talents are being applied to the work that you do? Volunteer to be involved in new projects at work; Enroll in a course to upskill yourself outside of work; Explore the option of pitching your boss/company to fund your course fee; Attend relevant conferences/seminars; Raise your hand to join a new project, drive a new L&D program or Employee Mentorship initiative; enroll in a courses to up-skill yourself, or attend relevant conferences/seminars). The future of your current career / role is also dependent on how well it aligns to who you want to become, what you want to learn, and how you prefer to work. Is your work environment conducive to your preferred learning / working style / professional goals? Does your work inspire you to do more and be more? A fulfilling career should allow you to see the possibilities for your future - where you can go and grow - and how you can get there. if you want a fulfilling career, you have to create it by actively seeking out + finding the opportunities that will pull those factors into your work-life. But you need to know WHAT FILLS YOUR CUP and owe it to yourself to OWN what you really want and then make it happen. 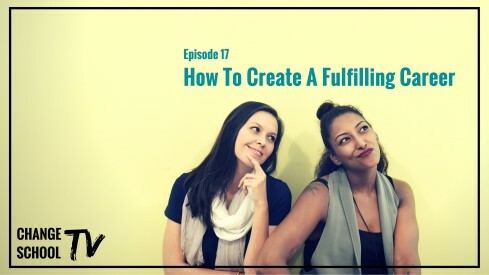 ACTION #1 : Figure out what a fulfilling career means to you. Reflect on the Q’s shared earlier and take a deep + honest look at whether your current job / career is giving you that. Clarify your vision for the future - imagine your ideal life and career, and consider whether your current job/role will help you move closer to that dream. If you’re job isn’t really want you want to do for the rest of your life, but you’re content with your pay and co workers, you’re probably selling yourself short. Don’t be complacent. If deep down inside, you believe you’re meant to be doing more, it’s time to listen to your gut and honor your full potential. If all the signs are pointing to the fact that your current job/role isn’t fulfilling you, it’s time to think about your next step. ACTION #2 : Take one small step forward. Update your CV or spend an hour to researching career opportunities or apply for a job or role of interest just for fun. Complacency will eventually lead to fear, and fear holds us back. Too many smart and talented people stay in just-OK jobs for too long. By the time they decide to make a move, they’ve been out of the job market for so long that they lack the confidence to get back into the job market or even knowing where to begin. Your career success can’t be achieved alone - having supporters will enable you to get further, faster on your journey - you just need to take the first step. Whether that means speaking to your boss / manager about your learning pathways / growth opportunities, or working with a coach / mentor to strategize your career growth plan; or finally starting to explore alternative opportunities through recruiters or your professional network. ACTION #3 : Engage and enlist the support of people who can help you develop a plan and strategy to advance yourself and your career. Life is too short to be unhappy and stay in a job that isn’t filling your cup. If you missed our enrolment for our 6 week immersive online course - our waitlist is only a click away here. In the meantime, we’ve got some links to share to help you on your journey to creating a fulfilling career.